Trafton was raised on Chicago’s west side and played football at Oak Park High School under the legendary Illinois coach Bob Zuppke. He graduated in 1916 and then worked; life guarded at the Lake Michigan beach and played semi-pro football until he enlisted in the Army in 1918. He was stationed at Camp Grant in Rockford, Illinois and captained the base football team. 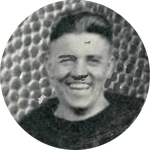 In the fall of 1919 he enrolled at Notre Dame University and played center on the same team as George Gipp. In January of 1920, while the starting center on the basketball team, he was expelled from school by the school’s athletic board of control after coach Knute Rockne discovered that Trafton had played for money that fall under assumed names with two professional football teams. By the summer of 1920 he was recruited by George Halas and given a job at Staley’s. To supplement his meager football earnings entering the Great Depression, Trafton participated in five professional boxing matches during the winter of 1929-1930. He made several thousand dollars crushing White Sox first baseman Art Shires in front of 5000 spectators in Chicago on December 16, 1929 before the two went night-clubbing together after the bout. After three more victories, “The Big Bear” met future world heavy weight champion Primo “The Ambling Alp” Carnera in Kansas City on March 26, 1930. The fight lasted only 50 seconds as Trafton went down 3 times in the first round. After receiving his $2,500 pay day, the Missouri boxing commission banned Trafton for life for not trying hard enough. “The Beast” years later told interviewers that he was basically told at gun point in the dressing room before the fight to make sure he didn’t win. Trafton next became the offensive line coach with the Cleveland Rams in 1945, moved with them to Los Angeles in 1946 and stayed until the completion of the 1949 season. From 1951 through 1953 he served as the head coach of the Winnipeg Blue Bombers in the Canadian Football League. [Future Bears’ head coach Neill Armstrong was a member of his first squad.] By the mid-1950s Trafton was back in Los Angeles, this time as a real estate agent.